Department of Spine Surgery, Indian Spinal Injuries Center, New Delhi, Delhi, India. Low back pain is a common ailment affecting individuals all around the globe. Majority of Disability Adjusted Life Years lost amongst working population is due to low back pain. Though majority of surgeons/physicians keep only spinal causes in mind while treating such an ailments, a number of other causes exist for such a pathology. This editorial aims to make the readers aware about such non spinal causes of low back pain. Since the time Lord Krishna corrected the kyphotic deformity of a female, spine surgery has seen massive revolution. However, the myth of remaining on bed/complete bed rest without a definitive diagnosis has existed since long among traditional orthopedicians. This myth is not only prevalent among the patients but also various physicians/practitioners. Many times, a patient with back pain is advised to stay on the bed and take medicines. With the advancements in spine and spine research, various causes of back pain have been found. Although a majority of spine surgeons/physicians focus on spinal causes of back pain, a few of the non-spinal causes must be kept in mind to make a definitive diagnosis before treatment. This helps the patient to achieve a satisfactory treatment. Visceral causes Dissecting aortic aneurysm, urinary tract infection, pyelonephritis, prostatitis, pelvic inflammatory disease, endometriosis, ovulation, pregnancy, ectopic pregnancy, acute pancreatitis, duodenal ulcer, cholecystitis, nephrolithiasis, visceral cancers. Visceral causes of back pain Bursitis Piriformis syndromes Spasticity Fibromyalgia Degenerative joint disease (DJD) Posture Limb length discrepancy Obesity Mood disorders Secondary gain. Sometimes, back pain is the single presenting symptoms of some of the medical conditions. It is important that the clinician identifies the cause and provides the necessary treatment. Management of such a disorder with simple analgesics may prove to be fatal/Examination of the abdomen with palpation of the visceral organs is a necessary step of diagnosis. Some of the differential diagnosis for such an ailment could be prostatitis, pyelonephritis, urinary tract infection, aortic aneurysm, acute pancreatitis, duodenal ulcers, cholecystitis, nephrolithiasis, and visceral cancers. Trochanteris Bursitis and ischiogluteal bursitis are types of pelvic pain that is sometimes misdiagnosed as herniated disc or sciatica from the lumbosacral region. This is most commonly encountered in the elderly population. The symptoms of trochanteric bursitis are a pain in the hip region with tenderness and increase in pain with activity. With ischiogluteal bursitis, the pain is localized deep in the center of the buttock which is aggravated by sitting or walking and accompanied by radicular pain which is not relieved by rest. Treatment includes rest, anti-inflammatory medications, physical therapy, cortisone injections, or sometimes bursectomy. It is sciatic symptoms which do not originate from the lumbosacral plexus or disc herniation but by pressure from the piriformis muscle on the sciatic nerve. The pain increases on activity such as prolonges sitting and walking. The muscle originated from the anterolateral aspect of the sacroiliac region, transverses the sciatic nerve and inserts into the Greater Trochanter of the Femur. It has the function of abducting the lateral rotator of Femur and is innervated by S1 and S2. The Sciatic nerve is found between the two bellies of Piriformis. Any irritation or inflammation over the muscle compresses the sciatic nerve and precipitates the symptoms of sciatica. Straight leg raising (SLR) test could help in differentiating piriformis syndrome from Lumbar Disc Herniation. SLR is usually negative in Piriformis syndrome unless the leg of the patient is flexed, adducted, and internally rotated. Spasticity is usually found in patients with chronic neurological illness such as stroke, spinal cord injury, and multiple sclerosis. It is clinically manifested as a hypertonic state of muscles with clonus and involuntary movements. Back pain is a cardinal feature of spaticity. It is a chronic pain syndrome which is characterized by widespread musculoskeletal pain, fatigue and heightened tenderness to tactile pressure, general fatigue, and sleep disturbance. The most common sites of pain include “tender points” of neck, back, shoulders, bony pelvis, and hands. Pain is described as a deep ache, sometimes shooting and burning. DJD of the hip is most often caused by arthritis. Such a condition causes ipsilateral groin and medial joint pain. Sometimes the pain may radiate to knee on the same side, creating the confusion if the pain is from hip or knee or lumbar radiculopathy. The pain from the hip can be easily distinguished from the lumbar radiculopathy as the latter does not affect the range of motion of the joint. Furthermore, various tests of osteonecrosis of femur head/osteoarthritis hip, etc., shall be positive in cases of DJD of the hip. The position of the body in both sitting and standing position has a considerable effect on back pain. Lumbar hyperlordosis in standing and slouched position on sitting can affect the health and functioning of the muscles of the abdomen and lower back. When daily activities require prolonged sitting or standing, this leads to various ailments of the back. There are a variety of causes for limb length discrepancy including previous injury or fracture to the leg, bony diseases, inflammation, and osteoarthritis and neurologic conditions. The correlation between patients with a clinically significant leg length discrepancy and the incidence of low back pain is controversial. The discrepancy in limbs could lead to pelvic obliquity which changes the coronal balance of sacrum leading to segmental scoliosis and increased risk of low back pain. Such a discrepancy may also lead to gait abnormalities in patients. Overweight is a contributing factor to back pain and a significant cause of seeking medical care. 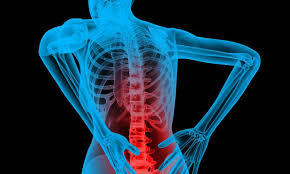 It can contribute to the symptoms of osteoporosis, osteoarthritis, degenerative spine disease, and spondylolisthesis. The extra weight usually translates extra strain to the lower back. In patients with chronic and disabling pain syndromes such as fibromyalgia and mood disorders are frequently encountered along with back pain. Patients with diagnosed anxiety and depression report higher incidences and greater severity of pain in addition to increased disability and dysfunction due to pain compared to patients without depression and anxiety. Treatment of both pain and mood disorder is challenging but can be accompanied by a comprehensive plan including cognitive behavioral therapy, relaxation techniques, hypnosis, exercises, antidepressants, and mood stabilizers. Secondary gain is an external psychological motivator that may drive a patient to report certain symptoms. If a patient’s pain or illness allows them to miss work or gain extra sympathy and attention, these would be examples of secondary gain. These need to be carefully identified by the physician. These are common causes which need to be kept in mind before treating a patient with back pain. Sometimes the illness is much beyond the spinal disorder and needs to be treated meticulously. A comprehensive multi-disciplinary approach is thus warranted. Srivastava N, Goel S. A study of patient satisfaction level in inpatient spine department of a tertiary care multispecialty hospital. J Med Res Innov. 2019; 3 : e000147 . Dougherty CD, Dougherty JJ. Evaluating hip pathology in trochantric pain syndrome. J Musculoskel Med. 2008; 9 : 428-36 . Cailliet R. Low Back Pain SyndromeFA Davis: Philadelphia, PA; 1988. Saladin K. Anatomy and Physiology:The Unity of Foam and Function1st ed: New York; 1998. Greenberg MS, Arredondo N. Handbook of NeurosurgeryThieme Medical Publishers: New York; 2006. Shiri R, Karppinen J. The association between obesity and low back pain:A meta-analysis. Am J Epidemiol. 2010; 171 : 135-54 . Means-Christensen AJ, Roy-Byrne PP, Sherbourne CD, Craske MG, Stein MB. Relationships among pain, anxiety, and depression in primary care. Depress Anxiety. 2008; 25 : 593-600 . Sorry, there is no peer review to display for this article*. Our policy of displaying a paper's peer review history applies only to papers published from 8th October, 2017. *So either this article was published before 8th October, 2017 or this is a non-peer reviewed article.